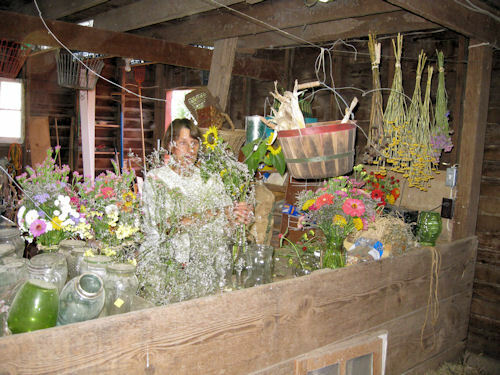 Linda at work in the barn arranging flowers. The bench is in an old stall with the old feed bunk converted to a high table top for easy stand-up flower arranging. August 30, 2009 – Raspberries! It’s more or less the peak of fall raspberry season. We’ve jammed, canned whole berries, made canned raspberry sauces, pies, crisp, and frozen whole berries. We also sent 52 cartons to the Des Moines Farmer’s Market yesterday. 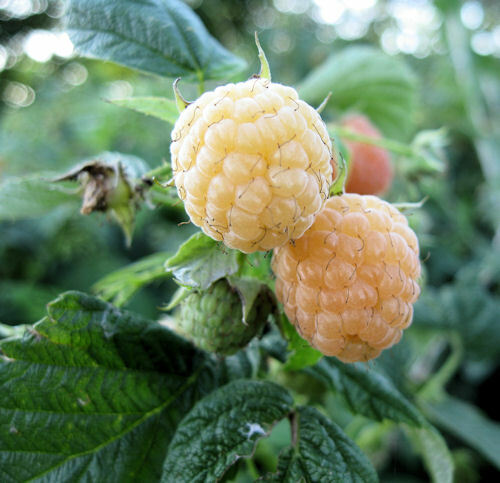 These are the golden raspberries – we only have about 15 foot row of these and that is enough. They are not quite as tasty as the red and seem slightly more susceptible to fungus. They do however offer a beautiful contrast in the box mixed with the reds. 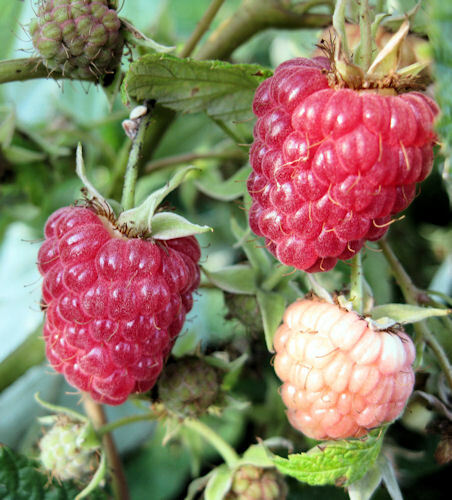 The old standby fall raspberry variety – Heritage. 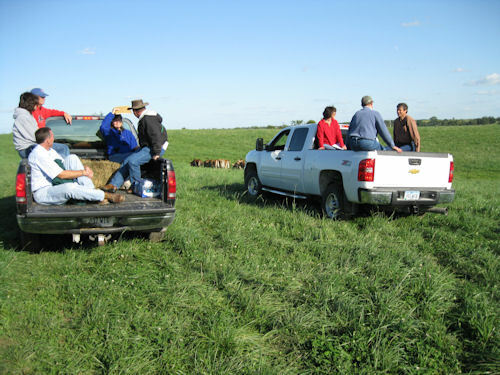 Today we went to a PFI field day to what may be one of Iowa’s biggest organic farms, nearly 1,000 acres, located west of Iowa City in Keokuk County. 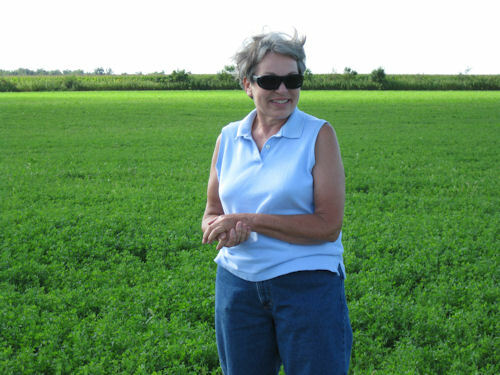 Linda Grice operates this farm and here shows off a 90 acre field of alfalfa that it transitioning to certified organic. 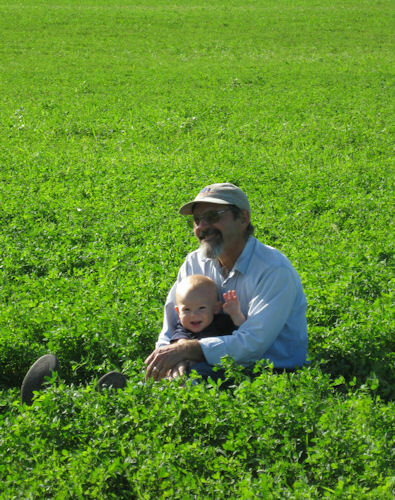 It’s a great place for one of our favorite Powesheik County farmers to sit and listen with his son. Riding in the backs of pickup-trucks on a bumpy drive through the pasture is one of life’s lost joys. This section of the farm is custom grazed (meaning a nearby dairy farm rents it to graze Jersey milk cows). Here Linda points out one of her paddocks that includes a pond. 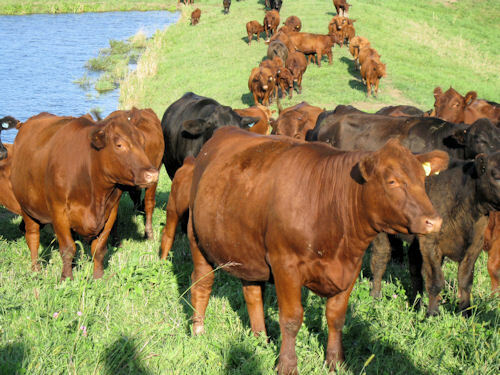 Usually it is not good practice to have a pond available for cattle to graze around, but in a rotational system there are little to no detrimental water quality effects, especially if the paddock that contains the water is grazed during cool weather. You’ll see that vegetation is not turned to mud along the shore. This is a fine group of organic grass-fed beef cattle. The critter closest to the camera is in its second year and has always just eaten grass. 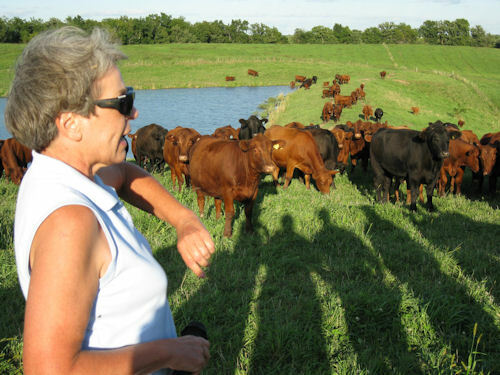 She has some cattle that are totally grass-fed and others that she sells to Organic Valley that the company wants finished on a combination of grass and grains. It was a great day and just wonderful to see such a large, successful, environmentally-friendly operation. 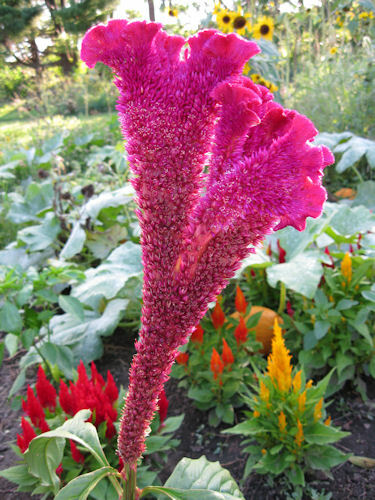 This variety of celosia reminds me of something out of a Dr. Suess book. The flat, fungus-looking growth habit with its brilliant color are eye-catching. There are many varieties of celosia, some of its less showy cousins are visible in the bottom of the photo. It’s going to be a lean chicken year at high hopes this year. 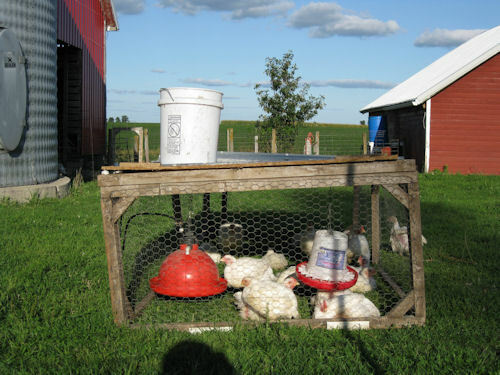 Uncertainty about lockers closing down and deliberations about buying a chicken plucker pushed our decision to get chicks out to our second batch time, and the skunk killing about 65 of our chicks leaves us with about 35 left, probably about enough for our family and none for sale. The remaining chickens are tucked away in their movable chicken tractors where they get fresh pasture daily and protection from varmits. There’s a very interesting article in this month’s Wired magazine about Craigslist founder, named, oddly enough, Craig Newmark. The article spends some time berating the site for not being all it could be in terms of design and profit. The site only charges fees for a few kinds of ads, mainly help wanted in large cities. Best estimates are that these ads earn about $100 million per year. The rest of us get to post and browse free classified ads. Craigslist gets more hits than Ebay or Amazon. Many people think that with a redesign of the site, or making sponsored ads or charging a minimal fee that Craigslist might be worth a sum in the billions of dollars on the open market. When asked about why he doesn’t try to make more money from a potential goldmine of a site, Craig’s philosophy comes through as he “already has a parking space, a hummingbird feeder, a small home with a view, and a shower with strong water pressure.”Â What else does he need? He also dislikes meetings and tensions between technology and internal business units. At Craigslist there is no tension between the marketing, sales, and technology groups, because there is no marketing or sales departments. He’s put technological back-door roadblocks in place to prevent automated searches across all of Craigslist locations, insisting it is for local commerce only. I think I’d like this guy! 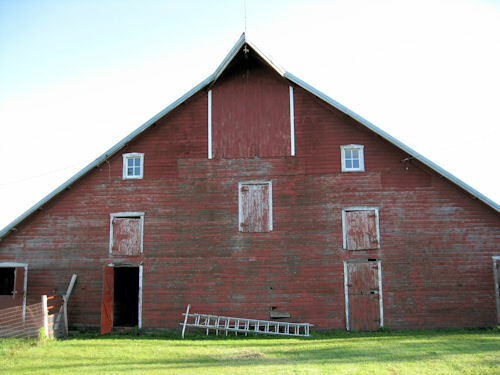 I can’t stand the tacky looking north side of the barn any longer. I’ve started staining it red to avoid future scraping. The worst part is complete, above the top windows – it’s probably between 35-40 feet to the top – which is a long way up on a ladder. I happy that part is complete, and now the trips up and down will be much shorter and not nearly as far to the ground! We have a friend who works for the USDA seed bank in Ames, preserving many varieties of seeds. One of the latest plants to be grown out for fresh seed was a variety of Hungarian parsley. photo credit: ISU News Service. 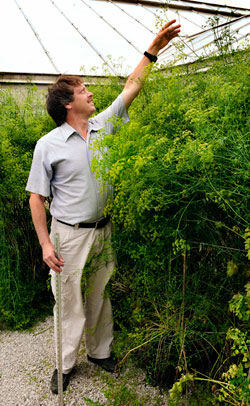 This plant grew to be about 7 feet 10 inches tall. The whole story can be found on an ISU news page. The plant is in the process of being certified by the Guinness Book of World Records as it beat the old record by nearly 2 feet! Now if you ever have to roast a whole cow and need a garnish, is the parsley for you to grow! 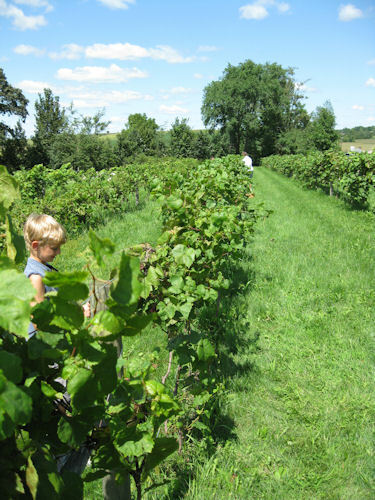 One of Linda’s students has started a vineyard. 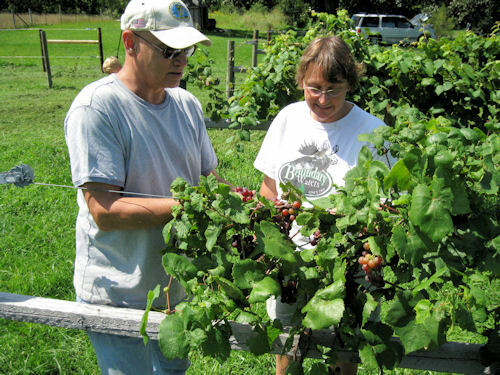 He’s just getting started, but has a few producing vines in production. Linda looks over the crop. A view down one of the aisles. 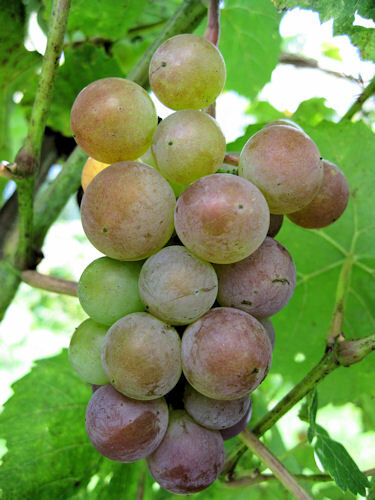 Some Iowa grapes, about ready for harvest. 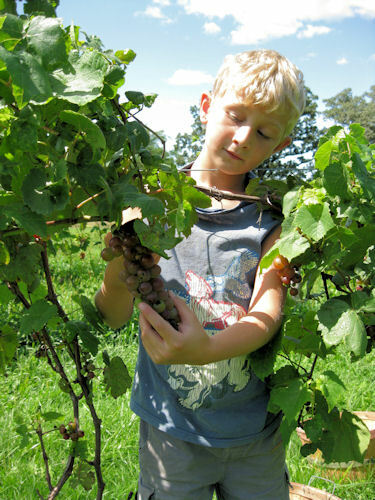 We had the chance to take some home – so we did and made about 20 quarts of grape juice. Here Martin admires a bunch of grapes. I visited with our local NRCS contact this week to get updated on new conservation programs and was alerted to a new project about two miles from our house. He invited me to go take a look, so I did, and you can too! 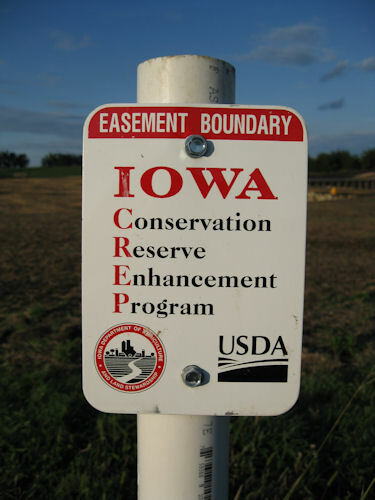 This is the Conservation Reserve Enhancement Program. According to another similar site I visited in Story County, farmers get 15 years of annual payment equal to 1.5 times the average cash rent of the county. Then, they need to keep the land in the program an additional 15 years without additional payment. Here’s a view from this project from a distance. 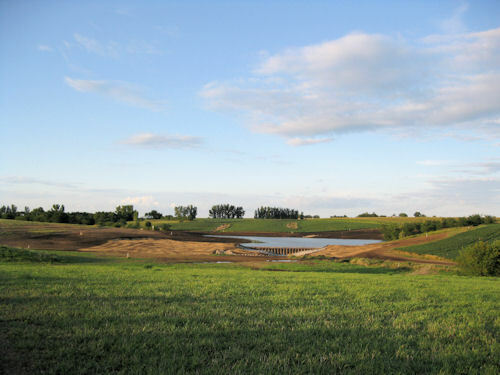 The area that looks brown and tilled was just replanted as this wetland was just created. 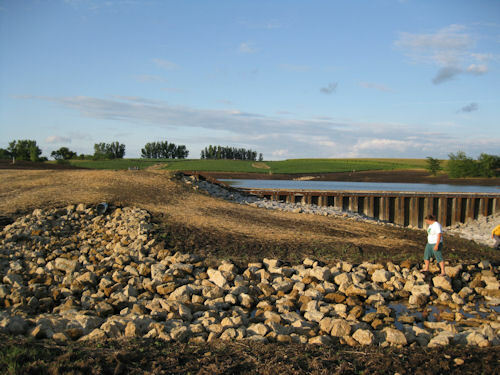 The dam or weir is built to pond water and to the left you can see the culvert draining from the top of the wetland. In case of heavy rain, the water pours over the dam onto the rocks below it. Instead of field tiles draining directly into creeks and streams, all the field tiles in this area drain into this basin and nitrogen is consumed by aquatic plants before exiting the wetland much cleaner than the water came in. 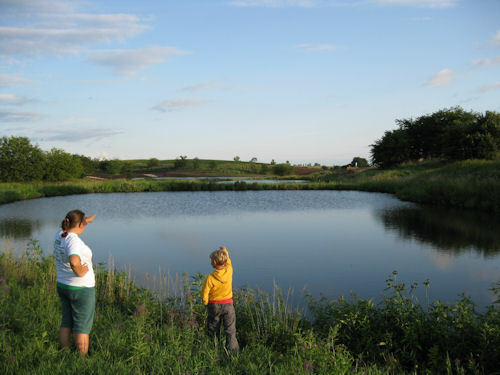 Wildlife enhancement is a wonderful by-product of the project – in an older pond upstream of the dam, we saw ducks, geese, and an egret, among other creatures. 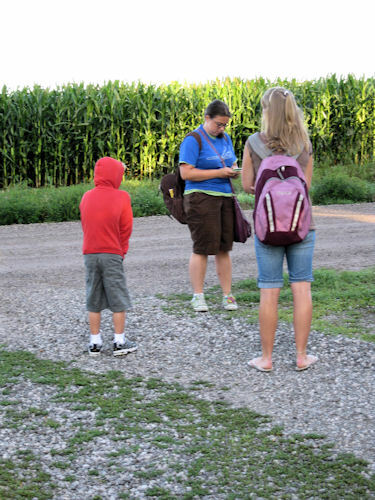 This year the kids all got on the same bus the first day of school! 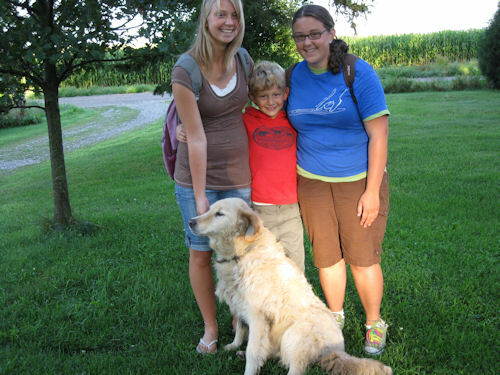 Here’s the traditional picture – the girls insist on having April in the picture since she has wandered into so many in the past. Today was a trip up to Northfield, MN to visit a couple of colleges – St. Olaf and Carleton. These are the last two on the initial list. Now, we may or may not do visits when school is in session. It looks like Claire will have a difficult decision, but perhaps it will come down to finances in the end. If the top three school choices are a toss-up, it might depend on the financial aid package each is able to offer.